Have you heard of this? It's the coolest thing ever! The Art House Co-Op offers this interactive art exhibit and ANYONE can be a part of it! Even me! 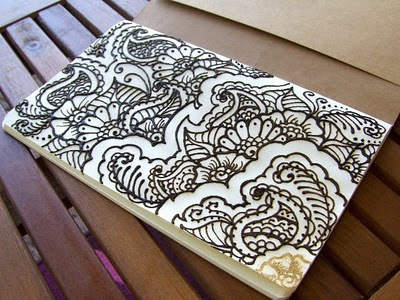 That's right, I've signed up to be part of the Sketchbook Project 2011. So what exact is it, you want to know? Here's how it works. You purchase a blank sketchbook (by October 31st) and fill it with ANYTHING you want; drawings, paintings, stories, pictures, collages, stickers, ANYTHING! You sent it back to the Art House Co-Op (by January 15th) and then in March 2011, the tour of 6 American cities begins that includes ALL of the Sketchbooks on display! After the tour is over all the sketchbooks become part of the permanent display at the Brooklyn Art Library. The really cool thing (as if this isn't cool enough) is you can track your sketchbook through the entire process. You can see how many people have looked at your specific book. Learn more about The Sketchbook Project 2011 and get started at the project website! I've completed the first page of my sketchbook doing what I know best...henna! Who knows what will fill the rest of those pages? What will fill your Sketchbook pages? Become part of this interactive art exhibit at The Sketchbook Project 2011. Best Bindi Body Stickers Yet!